Located in Melbourne’s rapidly expanding northern suburbs, Loan Gallery Finance* employs around 40 brokers and a total staff of 60 people. Established in its current form in 2013, the firm is active in the areas of first home buyers, loan refinancing and investor property financing. In such a large firm, the compliance workload is steady. When George Andonioff joined Loan Gallery Finance as Compliance Manager in 2015, he conducted a review of the firm’s insurance arrangements. Having dealt with Insurance House in a previous role, he invited them, along with other providers, to present a suitable costed solution for the ongoing management of the firm’s Professional Indemnity (PI) and Public Liability (PL) policies. "Over the past three years, I’ve always found the Insurance House team highly professional. The proposal from Insurance House recognised that Loan Gallery is not a static business. In terms of maintenance, brokers come and go. This requires continual additions to and deletions from the company’s Professional Indemnity Certificate – typically 40 or more changes each year. George only has to make a simple phone call or email. George has never had to test the Insurance House claims process, though! In addition to PI cover, each broker is required to hold their own Public Liability insurance. 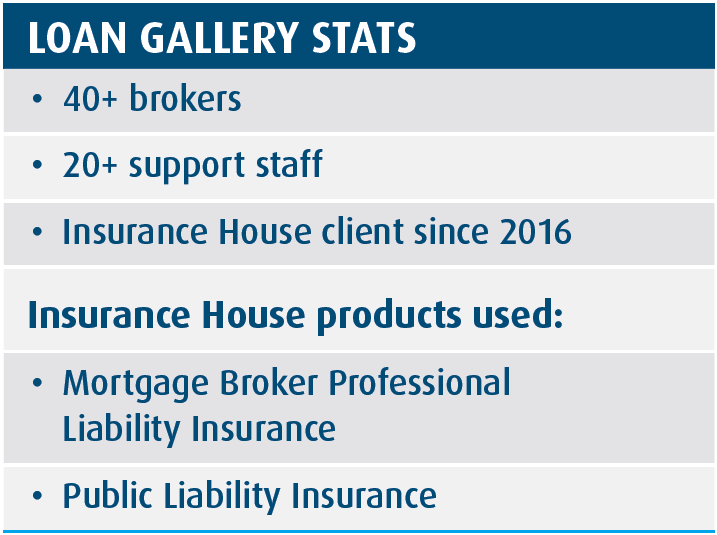 Again, Insurance House offered a competitive price and high level of service, so the majority of Loan Gallery brokers opt for it. “Insurance House is highly attuned to our commercial realities,” he says.